Complete your own Indiana State Court Administration divorce forms using DivorceWriter. You'll receive all the documents you need to get a divorce in Indiana, ready-to-file with complete step-by-step instructions to guide you through the entire process. At least one spouse must live in Indiana for six months before the divorce is filed. To meet the no-fault grounds for divorce in Indiana all that is required is that your marriage be irretrievably broken down. This just means that it is damaged beyond repair. You review and sign the completed documents. File the Indiana Petition for Divorce and remaining documents (including Settlement Agreement, Decree, and more) with the court clerk. 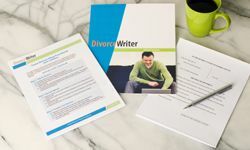 DivorceWriter uses the official Indiana divorce forms and guarantees that your documents will be accepted by the court or we will refund your entire purchase. You have qualified to use DivorceWriter to complete your Indiana divorce papers online. Select "Continue" to start the interview.